In an increasingly polarized world, New York Times Opinion Editor Bari Weiss stays unflinchingly moderate. 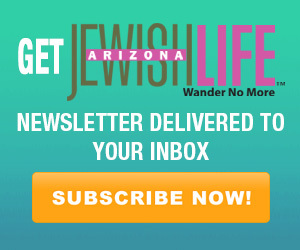 Bari’s highly personal columns about the shooting at Pittsburgh synagogue where she became a bat mitzvah will resonate with many in Arizona, who distinctly remember Jan. 8, 2011, when a deranged young man shot Congresswoman Gabby Giffords in the head and killed six of her constituents. 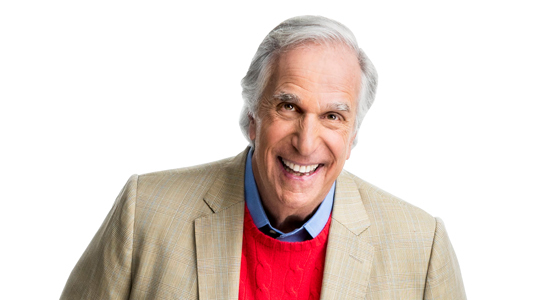 Bari’s Nov. 2, 2018, column began: I want to tell you what it is like when your neighborhood becomes the scene of a mass murder. “The first thing you should know is that when your phone pings with a text from your youngest sister saying, ‘There is a shooter at Tree of Life,’ your brain will insist that it is not true, that it is a hoax. Bari says her columns on the Tree of Life shooting have likely played a role for the increased call for her to speak around the country. In the first three months of this year, Bari had dozens of talks to Jewish and non-Jewish groups scheduled around the country, with a European trip in the works for late spring. 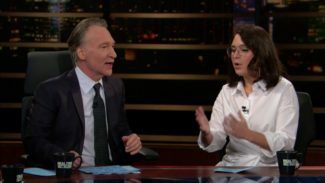 Bari Weiss with Bill Maher. Photo by HBO/Janet Van Ham. 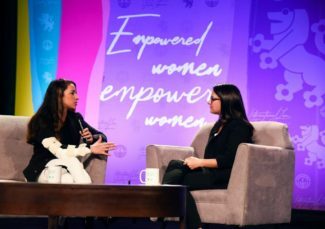 “I’ve done some speaking to Jewish groups over the years, but this year the demand is really unlike other years,” she says. She attributes the rise to a few things: the shooting in Pittsburgh that killed 11 people in the synagogue where she grew up and where family and friends still attend; her recent writing about anti-Semitism and Israel; and her increased visibility with multiple appearances on “Real Time with Bill Maher,” “Morning Joe” and other media. A Twitter storm erupted after her column and her Bill Maher appearance. But Bari thinks public opinion (and Twitter) have shifted closer to her view. “I’ve brought a lot of young women, libertarians and center-right writers … to bring more diversity to our op-eds,” she says. Bari is no stranger to diverse viewpoints and political debates. The family also belonged to three synagogues – Reform, Conservative and Orthodox. She says that was a reflection of the beauty of Pittsburgh’s Squirrel Hill Jewish neighborhood, where people don’t stay in their own lanes. “My sisters and I were among the youngest Torah readers at our Conservative synagogue,” she says. She became a bat mitzvah at the Tree of Life synagogue, where an active shooter massacred 11 people during Shabbat services Oct. 27, 2018. “I’m really proud to be from Pittsburgh,” she says. During her appearances since then, Bari says she has focused her comments about the shooting on the anti-Semitism that inspired the shooter. “It seems there are two strains of anti-Semitism in the United States and across the West,” she says. “Anti-Semitism of the far right comes from blood and soil nativism and focuses on our globalist sympathies,” she says, noting that was the motivation of the Pittsburgh shooter, who railed against HIAS (Hebrew Immigrant Aid Society) helping refugees of all faiths come to America. At the Times, Bari’s columns about Israel have raised the ire of both ardent Zionists and Palestinian supporters – yet another area where her centrist opinions are attacked in this polarized climate. “People take my criticism seriously because they know the criticism is coming from a place of love,” she adds. The 2016 election offers an important lesson for journalists. Social media has created a third challenge for journalists in today’s divisive world. Bari writes she cut back on her Twitter use after reading Jaron Lanier’s book Ten Arguments for Deleting Your Social Media Accounts Right Now. The two women also agreed on the importance of engaging with those with whom you disagree. 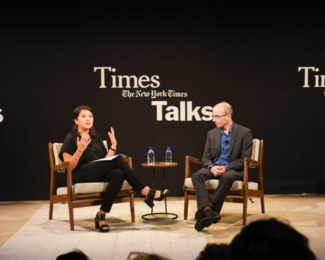 Bari Weiss interviews Yuval Noah Harari during a Times Talk. Bari engages with many people through Times Talks including philosopher Yuval Noah Harari and University of Chicago President Robert Zimmer. Times Talks are among many public events that the Times hosts in the event space of the Times Building. 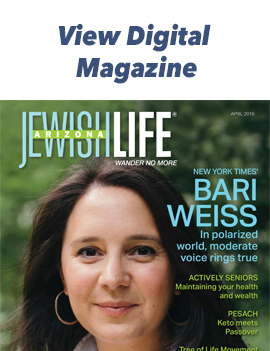 Bari edited the news and politics section of the online Jewish magazine Tablet from 2011 to 2013. She continued contributing to Tablet while working as associate book review editor and opinion writer and editor at the Wall Street Journal from 2013 to 2017. She moderated the Jewish Book Council’s “Unpacking the Book: Jewish Writers in Conversation” series from its debut Feb. 24, 2015, through season three’s first two conversations in 2017. “Unpacking the Book” brings together noted writers for conversations on a specific Jewish theme at each program. For a 2016 talk “Gefilte Fish on Fleek: The New Jewish Cuisine,” Bari interviewed Chef Rossi, Michael Solomonov, Michael W. Twitty and Niki Russ Federman. Bari graduated from Columbia University in 2007. She was a Bartley Fellow at the Wall Street Journal in 2007 and a Dorot Fellow from 2007 to 2008 in Jerusalem. During her junior year at Columbia, she also founded The Current, a journal of contemporary politics, culture and Jewish affairs. Of the things she launched as a student, she is proudest of The Current, which is still publishing. 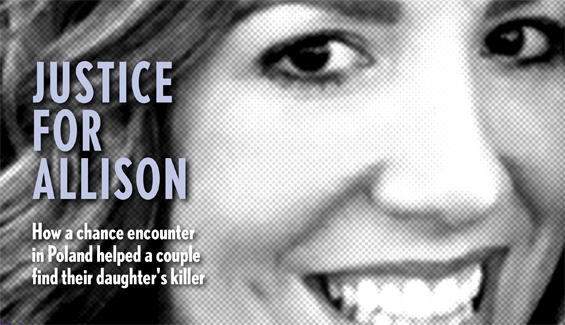 “Many talented journalists have come out of there,” she says. Bari Weiss herself was the first.